Office Hours: Usually the office is closed on Wednesday. Going South on I-15 Take the 5300 South exit and head east, making a right onto State Street. Turn left onto 5770 South and follow this until you run into Fashion Boulevard. 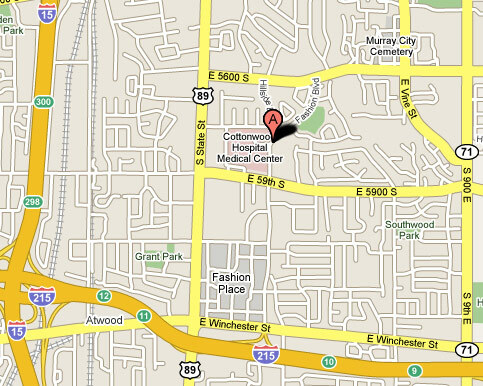 Great Expectations is located in the brick/glass building across the street from TOSH, the old Cottonwood Hospital. Our office is on the first floor, at the north end of the building. Going North on I-15 or East on I-215 Follow I-215 Eastbound and exit at State Street. Take State Street north and make a right turn onto 6100 South, followed by a left turn onto Fashion Boulevard. Head north for a couple blocks and you will see TOSH, the old Cottonwood Hospital, on your left and the brick/glass building where Great Expectations is located on your right. Our office is on the first floor, at the north end of the building. Going West on I-215 Take Exit 10 to 280 East and follow straight through the light, which will put you on Fashion Boulevard. Follow this until you see TOSH, the old Cottonwood Hospital on your left, and the glass/brick building where Great Expectations is located on your right. Our office is on the first floor, at the north end of the building.